If you think recycling means putting some materials into a different container to reduce landfill waste, think again! Recycling is a full circle process that creates jobs and stimulates the economy when materials are collected, processed and used to produce new goods. Using recycled materials rather than raw materials conserves natural resources and energy, and reduces carbon emissions. Check out the Change the World "Tools" calculator below and calculate your household footprint. Many hazardous materials, like paint, batteries and fluorescent light bulbs, should also be recycled to protect the health of your family and your community. Many communities have curbside recycling, but do they accept everything? Do you live in an area without curbside recycling? If so, do you know where to take your materials? Do you want cash back for some of your materials? To get started, check out the resources on this page. MORA provides information on the nearest recycling facilities and what materials they accept. We try to keep information current, but rely on our members to update statewide information. If you know of a recycling opportunity that is NOT listed through our website, please let us know. Missouri Solid Waste Management Districts coordinate local recycling activities across the state. To find out what is happening in your area, click on the map and follow the link to your District. The MDNR compiled lists of drop off sites for many recycled materials across Missouri. * The MDNR information was last updated in 2010. Some information may have changed. Want to find out your carbon footprint, or see how much recycling can impact the environment? Click on "Tools" below to find environmental calculators that can help you better understand how your waste reduction and recycling decisions impact climate. 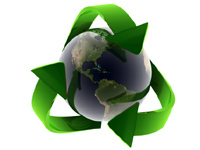 Earth911 provides a complete database of recycle centers near you! Just click the button below and type in your area code! Many household materials are recyclable. Some materials, like metals, have enough value that you can get cash back for recycling; for others, such as used clothing and household goods, recycling helps support a local charity. Those who sell batteries, fluorescent lamps and ink cartridges offer easy and convenient ways to recycle. Finally, some waste materials like oil and paint are recyclable but can harm the environment if not taken to a household hazardous waste facility. Follow the links below to learn more about how to recycle these special items in your area. Stop junk mail delivery. It is even better than recycling! Don’t know what to do with household hazardous waste?